Can two people who have faced their share of loss come together and find a new beginning filled with hope and love? 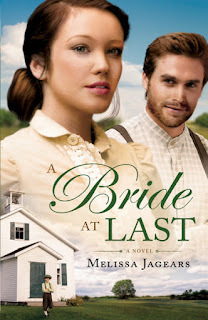 That is the story A Bride at Last by Melissa Jagears shares with us. Kate is a strong woman of good moral character, she is devoted to her dying friend and taking care of her young boy when the friend passes. Things get heated in her life when two father's show up claiming the boy - and Kate really has no stake on the child she has come to love as her own. Only wanting what is best for the boy she teams up with the best choice and sets to making things good for them. Along the way she sees that maybe their life might be good with her in it but can she overcome hurts of the past? Can Silas allow himself to trust again and fall in love? This was a sweet book - I really enjoyed how the characters were developed. Jagears writes a book that is believable for that time which I truly appreciated. Kate isn't written as a modern woman under the constrains of her time but as a practical women in her time, knowing her appropriate role. The romance was slowly built and I liked that too! Overall an enjoyable summer read! Kate Dawson was supposed to be a mail-order bride, but upon realizing she'd been deceived about her intended groom, she's now settled into life as a schoolteacher. When the mother of a student passes away, Kate assumes she'll take on care of nine-year-old Anthony-until two men suddenly show up in town, claiming to be the boy's father. You can purchase your copy of A Bride at Last at your local book retailer or online at stores like Amazon.